As more and more applications are developed and deployed using containers, it is important for IT Operations and DevOps teams to be able to manage the container infrastructure. They must also ensure that these containers maintain and adhere to their internal security and compliance regulations. SUSE Manager, delivers best-in-class open source infrastructure management with new enhancements focused on improving DevOps efficiency with enhanced management of software templates and compliance, in hybrid cloud and container infrastructures. 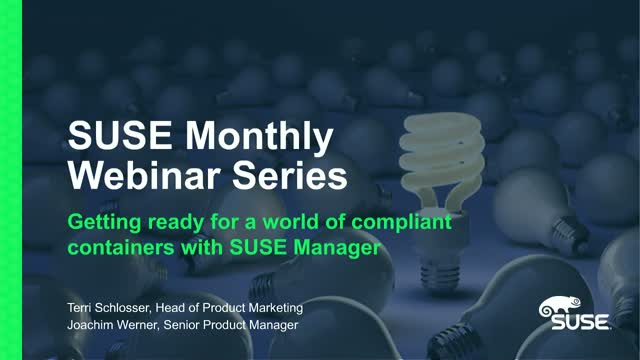 Join us to learn more about how SUSE Manager can help you get ready for a world of compliant containers.